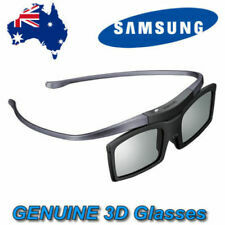 Samsung Active 3D Glasses for 3D TV SSG-3050GB, 2 Pairs. Condition is New. Dispatched with Royal Mail 1st Class. These are the active battery operated ones that take 1x CR2025 battery (included). Samsung Active 3D Glasses. Work With All Active TV Sets. Samsung :SSG-5100GB 3D Active Glasses. 3D Active Glasses. Note: Not compatible with previous Samsung TV's which featured a 3D Sync IR output, or 2010 Samsung 3D-ready TVs with IR emitter. Compatibility LED TV For all 2011, 2012, 2013, 2014 and 2015 Samsung D, E, ES, F, H and HU,JU,JS series 3D TV. 3 x Samsung Interactive 3D Glasses SSG-3100GB (As-New) Boxed. Condition is 2 have been Used once or twice and 1 pair is Brand New with protective lens film still intact. All 3 are boxed with cleaning cloth and there is one set of instructions. They made need new batteries as I dont have the TV to test any more. Dispatched with Royal Mail 1st Class. And with a battery type for extended viewing, which lasts up to 150 hours, you can now sit back in total comfort and enjoy as much 3D TV as you like. It’s the 3D experience you’ve always wanted. Settle for nothing less than the absolute best 3D experience. Condition is New and unused - box carefully opened to show contents. Bought them to use with a Panasonic 3D tv but no longer have the TV. Used once and comes with battery, although not sure if batter will need replacing. Therefore listed as used. 2 pack. Back a little Tatty - please study pictures. But comes with all packaging. Thanks for looking. Have 2 sets listed. Battery has gone so that'll be needed. But otherwise in perfect condition. Never been used. No box but original plastic wrapping. Genuine Samsung SSG-5100GB Ultra-Light Weight Active 3D Glasses - 2 Pairs. Dispatched with Royal Mail 1st Class. Settle for nothing less than the absolute best 3D experience. Most Samsung D, E, ES, F, FH, H, HU, JS and JU series LED 3D HDTVs. Bring 3D to Life. Most D, E, F and H series plasma 3D HDTVs. Fit-over Glasses. 2x Genuine Samsung SSG-5100GB Ultra -Light Weight Active 3D Glasses. Hardly used. 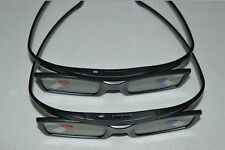 2 pairs of active 3D TV glasses Samsung PS51D8000 Plasma. Condition is Used. Dispatched with Royal Mail 2nd Class. As new working order. No scratches. Will not sell separately. Samsung SSG-5100GB 3D Active Shutter battery operated TV glasses (x2 pairs) Boxed with batteries included. Brand New and Sealed. 2x 3D active glasses SSG-5100GB. Complete kit still in the box, complete with spares. Happening at a speed too fast to notice, your TV shows each eye a different image, creating the illusion of depth. The screens synchronise with your 3DTV which switches between showing images for your left and right eye when the corresponding lens lets the image through. Samsung TV 3D Active Glasses x 2 Pairs SG-5100GB. Condition is Used. Dispatched with eBay delivery – Shutl 2-3 days. 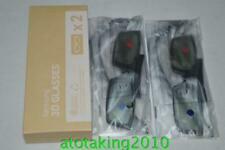 3d glasses active Samsung 2 Pairs SSG-4100GB (4 Glasses). Condition is Used. Dispatched with Royal Mail 1st Class. Samsung 3d active glasses SSG-P51002GB x2 boxed with instructions. Condition is Used. Dispatched with eBay delivery – Shutl 2-3 days. 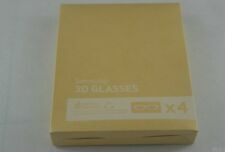 Samsung 3D glasses - SSG-4100GB - 2 pairs. Condition is New. Dispatched with Royal Mail 1st Class. For sale here is a pair (x2) of active 3D TV glasses. These are genuine Samsung glasses which have seen very little use which is the main reason for sale. They are both in full working order and are in very good condition as they have been kept in their individual pouches. Samsung SSG-3300GR 3D Active Glasses - For from 2011 Samsung TVs Only. New and unused. Experience the incredible reality of Full HD 3D right in the convenience of your own home with this amazing product, MegaMind 3D. Seal had been broken for picture purposes only (in the past). Unsure if battery works as it’s been in storage and never used. If ever, battery replacement is no more than £2. Checkout my other items. Thank you for looking! Samsung 3D starter kit 3D Blu-ray cd. Compatible with all our 3D Samsung TVs. Active glasses. The fit-over design is perfect for users who already wear glasses. 9000 minutes battery life. A graded item may be incomplete - it may have minor parts or accessories missing that do not affect its functionality. Model number SSG-2100AB. Type: 3D TV Glasses & Accessories. Item Details Data & Sizing Other Information. SAMSUNG 3D Glasses - SSG-5100GB. Samsung 3D Active Glasses SSG-5100GB 2 Pairs. Condition is Used. Dispatched with Royal Mail 1st Class. Samsung 3D active glasses SSG-3100GB. Condition is New. Dispatched with Royal Mail 2nd Class. Samsung 3D Active Glasses. 3x ssg 4100gb & 2x ssg 3100gb.